For other persons named James Guthrie, see James Guthrie. James Guthrie (December 5, 1792 – March 13, 1869) was a Kentucky lawyer, plantation owner, railroad president and Democratic Party politician. He served as the 21st United States Secretary of the Treasury under President Franklin Pierce, and then became president of the Louisville and Nashville Railroad. After serving, part-time, in both houses of the Kentucky legislature as well as Louisville's City Council before the American Civil War (and failing to win his party's nomination in the Presidential election of 1860), Guthrie became one of Kentucky's United States Senators in 1865 (until resigning for health reasons in 1868 shortly before his death). Although Guthrie strongly opposed Kentucky's secession from the United States and attended the Peace Conference of 1861, and sided with the Union during the Civil War, he declined President Abraham Lincoln's offer to become the Secretary of War. As one of Kentucky's Senators after the war, Guthrie supported President Andrew Johnson and opposed Congressional Reconstruction. Guthrie also was a director of the Louisville and Portland Canal Company, the first president of the University of Louisville, and presided over the Kentucky Constitutional Convention of 1849 (which explicitly ratified slavery in the state until its abolition after the American Civil War). During the Civil War, Guthrie resisted federal pressure to nationalize the Louisville and Nashville Railroad, but allowed the Union to use it to move troops and supplies. James Guthrie was born on December 5, 1792 near Bardstown, Nelson County, Kentucky to General Adam Guthrie (1762-1826) and his wife, the Pennsylvania-born Hannah Polk (1765-1842). Though his grandparents emigrated from Ireland, Guthrie was of Scottish descent. and his ancestor James Guthrie was a Scottish clergyman executed in 1661 after the Restoration of King Charles I (although the Scottish parliament in 1690 posthumously reversed the bill of attainder that led to his execution). Adam Guthrie moved from Virginia across the Appalachian Mountains into Kentucky and married Hannah Polk in 1788. They would have three sons and five daughters who survived to adulthood. Having fought Native peoples until they left the area after the American Revolutionary War, the senior Guthrie developed a large plantation in Nelson County, and twice won election to the Kentucky General Assembly (serving from 1800 to 1805, and again in 1808). James Guthrie received some of his early education in a log schoolhouse. During his father's military campaigns, Guthrie studied at McAllister's Military Academy in Bardstown. In 1812, young James Guthrie took a job on a flatboat transporting goods (and slaves) down the Ohio and Mississippi Rivers to New Orleans, Louisiana. After three such trips, he decided to change careers, and began to study law under Judge John Rowan, along with Ben Hardin and Charles A. Wickliffe. In 1821, Guthrie married Eliza Churchill Prather. The couple had three daughters--Mary Elizabeth, Ann Augusta, and Sarah Julia-- before Eliza Prather Guthrie died in 1836. Sarah Julia Guthrie married chemist J. Lawrence Smith, after whom the J. Lawrence Smith Medal is named. Admitted to the Kentucky bar in 1817, Guthrie began his private legal practice in Bardstown. In 1820, Governor John Adair appointed Guthrie as Commonwealth's Attorney for Jefferson County, Kentucky, whereupon Guthrie relocated to what was then the town of Louisville. In 1824, he served on a committee which sought to have Louisville recognized by the state legislature as a city (the state's first). The effort failed, but Guthrie was elected to the town's board of trustees, and later became its chair. The following year, Guthrie became a director of the newly formed Louisville and Portland Canal Company. He helped secure federal funding for a bypass around the Falls of the Ohio. However, although Kentucky's long-time Senator Henry Clay supported such internal improvements, his political opponent Andrew Jackson when elected president, cut off these funds shortly after taking office in 1829. Guthrie then secured private funds and the canal was completed in late 1830. Within a few years, however, steamboats became too wide for the canal, and their increasingly high smokestacks interfedered with bridges, so it became more an impediment than an aid. Jefferson County voters elected Guthrie, who ran as a Democrat, to the Kentucky House of Representatives in 1827. In his first year, he chaired the Internal Improvements Committee. In this capacity, he promoted construction of a number of roads and canals, as well as a railroad connecting Louisville to Frankfort. During his service in the House, Guthrie came to chair the Committee on the Courts of Justice. In 1828, Guthrie mustered enough support to secure city status for Louisville. He was elected to the new city council, and quickly became chair of its most powerful committee, the finance committee. Guthrie also served in the House (a part-time position) until 1831, when he was elected to the Kentucky Senate. Fellow legislators twice chose him President Pro Tempore. He served on the Finance and Education Committees. In 1834, Guthrie helped found the State Bank of Kentucky, and served as one of its directors. He unsuccessfully ran for a seat in the U.S. Senate in 1835. Back in Louisville, Guthrie advocated constructing a new building to house both city and county government offices. Secretly, he hoped Kentucky's capital would be moved to Louisville and that building would become the state's capitol. However, the Panic of 1837 halted the courthouse's construction, as well as the water works and a bridge over the Ohio River connecting Louisville to Indiana. Some called the unfinished courthouse "Guthrie's Folly", but it was still touted as Louisville sought to become the state's capitol in 1842. All three projects were eventually completed, and Guthrie's Folly became the Jefferson County Courthouse. In 1836, a dispute arose among the medical faculty at Transylvania University. Guthrie encouraged some of the disgruntled faculty members to relocate to Louisville and start the Louisville Medical Institute, a precursor to the University of Louisville. In 1843, Guthrie became the third president of Louisville Medical Institute. In 1846, the Kentucky General Assembly chartered the University of Louisville, which subsumed the Louisville Medical Institute. Guthrie became president of the university on December 7, 1847 and served until his death. Working with the Trustees of the Common Schools, Guthrie established a high school that met in the university's academic building; this school became Louisville Male High School. Guthrie also promoted creating a Board of Health, as well as free public schools in Louisville. He encouraged the city to purchase the turnpike between Louisville and Portland (a town now absorbed by the city of Louisville) as well as to purchase stock in the Louisville and Ohio Railroad. He also convinced the city to buy the land that would become Cave Hill Cemetery, and his final resting place. Guthrie served on the Louisville City Council until 1839. In 1845, he was a delegate to a convention on internal improvements held in Memphis, Tennessee and chaired by John C. Calhoun. Guthrie represented Louisville at the Kentucky Constitutional Convention of 1849. The delegates chose him president over Whig Archibald Dixon. The major question the convention addressed was slavery. Guthrie owned enslaved persons, and believed that, if freed, the slaves would become vicious and ungovernable. The Kentucky Constitution of 1850 included explicit protections for slave property, and stipulated that no amendments could be proposed for a period of eight years. Bureau of Engraving and Printing portrait of Guthrie as Secretary of the Treasury. President Franklin Pierce recognized Guthrie's financial acumen and appointed him Secretary of the Treasury in 1853. Soon, Guthrie became the most influential member of Pierce's cabinet. A hard money Democrat, Guthrie opposed a national bank, as well as small distinctive notes issued by free and charter banks. Instead, Guthrie advocated adoption of a universal currency that would be convertible to gold on demand. In his first report, he criticized his predecessor, Thomas Corwin, for making private arrangements for debt repurchases. He also accused Corwin of conspiring with a New York port master to under-report duties collected and deposit them into a trust. Guthrie caused a brief public uproar by removing the port master from his post. During Guthrie's tenure, the treasury had large budget surpluses due to the discovery of gold in California. He used much of these surpluses to pay down the national debt, which shrank from $63 million in 1853 to $25 million in 1857. He also purchased silver bullion for coinage which aided struggling banks by returning money to circulation and increasing their depleted reserves. He encouraged more efficient processes in the Treasury Department as a whole, and required monthly, rather than quarterly, reports from customs agents. In 1853, Guthrie employed Captain Alexander Bowman of the U.S. Army Corps of Engineers to begin construction of an extension to the Treasury Building's south wing. Many considered Guthrie to be the ablest Secretary of the Treasury since Alexander Hamilton. As President Pierce's term ended, Guthrie returned to Louisville and became vice-president of struggling the Louisville & Nashville Railroad. The railroad link between the two cities was completed in 1859, and in 1860, Guthrie succeeded John L. Helm as the railroad's president. He would continue as the railroad's president through the Civil War, and after he became incapacitated in 1868 advocated the board's electing former Union General William Tecumseh Sherman as his successor, although the board selected Russell Houston in 1869. Meanwhile, Kentucky delegates to the 1860 Democratic National Convention in Charleston, South Carolina favored Guthrie for the office of President. A two-thirds majority of delegates was required to secure the nomination. On the first of many ballots, Guthrie received 35 votes; by the thirty-sixth, he was up to 65.5, but still trailed the leading vote-getter Stephen Douglas, by 86 votes. With no candidate able to secure the needed votes, the meeting adjourned and reconvened in Baltimore, Maryland a month later. At the Baltimore meeting, Guthrie garnered 10 votes on the first ballot. He received 5.5 on the second ballot, which finally saw Douglas attain the necessary majority. Douglas was defeated by Abraham Lincoln in the presidential election. Guthrie was offered the job of Secretary of War by President Lincoln, but he declined because of age and failing health. Though a slave holder and states' rights advocate, Guthrie ardently opposed secession. On this topic, he stated "I hate that word secession, because it is a cheat! Call things by their right names! The Southern States have... originated a revolution." He was not convinced that Lincoln's election was an inescapable harbinger of war. He believed the Southern states, if they did not secede, would control Congress and the judiciary, and render Lincoln powerless to impose his agenda upon them. At age 70, Guthrie was elected as one of Kentucky's six delegates to the Peace Conference of 1861 in Washington, D.C. to devise means to prevent the impending Civil War. He was chosen to chair the conference's Compromise Committee. He failed in his attempt to re-work and re-introduce the Crittenden Compromise earlier proposed in Congress by fellow Kentuckian John J. Crittenden. 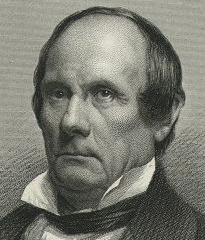 The Compromise Committee proposed a plan that included seven constitutional amendments and relied on Henry Clay's Missouri Compromise as a framework. Under the committee's proposal, 36°30' north latitude would continue to divide slave and free territory in the United States, and no more territory would be annexed except with the consent of equal representation from both slave and free states. The delegates to the convention presented this idea to Congress on February 27, 1861 and asked them to call a national convention to consider the question, but Congress rejected this report. Guthrie personally appealed to President Lincoln to consider the convention's report, but to no avail. Still convinced that war could be averted, he participated in a convention of border states held at Frankfort in May 1861. This convention also failed to avert the war. During the war, Guthrie's Louisville and Nashville railroad was of vital importance. It was the only rail line originating in the North and terminating in the South. Early in the war, the line was used to transport supplies to the Confederates in Tennessee, but after 1861, it was used primarily to benefit the Union. Despite pressure to relinquish control to the federal government, Guthrie remained president of the railroad, which became a frequent target for guerrilla attacks. Combining earnings from both passenger and military rates, Guthrie ensured that the line's infrastructure at the close of the war was superior to what it had been before the war started. Guthrie was a delegate to the 1864 Democratic National Convention in Chicago, Illinois. He voted for the ticket of General George B. McClellan and former Kentucky governor Thomas Bramlette for president and vice-president, respectively. At the convention, he also opposed the Wade-Davis Bill. The Kentucky Senate narrowly chose Guthrie over fellow Louisvillian and Union general Lovell H. Rousseau for a seat in the U.S. Senate in 1865. Senator Guthrie opposed the Republican Party's Reconstruction efforts. Guthrie supported President Andrew Johnson, opposed the Freedmen's Bureau and the passage of the Fourteenth Amendment. On February 7, 1868, Guthrie resigned his position due to ill health. He suffered a stroke on April 8, 1868 which left him paralyzed and bedridden for the rest of his life. On June 11, 1868, he resigned as president of the Louisville and Nashville Railroad, recommending General William Tecumseh Sherman to be his successor. Guthrie died in Louisville on March 13, 1869 and was buried in Cave Hill Cemetery. The city of Guthrie, Kentucky and Guthrie Street in Downtown Louisville are named in his honor. The United States Revenue Cutter Service, a branch of the Treasury, named small patrol vessels after Guthrie, in 1868, 1888 and 1895. ^ The names on the headstones in Cave Hill Cemetery are given as Eliza Churchill Prather, Mary Elizabeth Guthrie, Ann Augusta Guthrie, and Sarah "Sister Jule" Julia Guthrie. ^ According to the 1850 Federal Census Slave Schedules for Louisville District 2, Jefferson County Kentucky, Guthrie owned two elderly black women, aged 60 and 90 years old. Although this record appears at the bottom of a page, the next microfilmed page begins with another slaveowner. However the 1860 Federal Census slave schedule for Louisville, Jefferson County, Kentucky showed Guthrie as owning five adult male slaves (aged 60, 44, 40, 35 and 25 years old) and two female slaves aged 12 and 15. The 1840 Federal census used a very different form; James Guthrie there appears to have owned no slaves, but his six-person household included and elderly white man and an elderly white woman in addition to Guthrie, his wife and three daughters. Kentucky state slave schedules are not available for viewing online at ancestry.com, but records do indicate a man or men of the same name at two Jefferson County addresses in 1850, one in Louisville district 2, and the other in district 4 on the road to Frankfurt. Guthrie may have changed his slaveowning habits, or some of his adult male slaves may have been leased out in the prior census, Guthrie's name being fairly common and sometimes misspelt. ^ Herr, Kincaid A. (2009) . The Louisville & Nashville Railroad, 1850-1963 (paperback ed.). University Press of Kentucky. p. 50. ISBN 978-0-8131-9318-2. ^ "Guthrie (James), 1895" (PDF). United States Coast Guard. Archived from the original (PDF) on 2008-09-24. Retrieved 2019-02-13. James Guthrie (1792-1869) was appointed to be the 21st Secretary of the Treasury by President Franklin Pierce. He began his term in office on 7 March 1853, and served until 6 March 1857. ^ United States Coast Guard Historian's Office. "Ships and aircraft". USCG. Retrieved 2019-02-13. The American Conflict. Bacon & Company. 1865. Retrieved 2008-11-24. Baber, George (January 1912). "James Guthrie: Lawyer, Financier, and Statesman". The Register of the Kentucky Historical Society. 10 (28). Retrieved 2008-11-24. Bush, Brian S. "James Guthrie: Mr. Louisville". Archived from the original on 2011-07-08. Retrieved 2008-11-23. Bussey, Charles J. (1992). "James Guthrie". In Kleber, John E. The Kentucky Encyclopedia. Associate editors: Thomas D. Clark, Lowell H. Harrison, and James C. Klotter. Lexington, Kentucky: The University Press of Kentucky. ISBN 0-8131-1772-0. Cotterill, Robert S. (September 1922). "James Guthrie – Kentuckian, 1792–1869". The Register of the Kentucky Historical Society. 20 (60). Retrieved 2008-11-24. Cox, Dwayne (2001). The University of Louisville. The University Press of Kentucky. ISBN 0-8131-2142-6. Retrieved 2008-11-24. "Dictionary of Places: Guthrie". Encyclopedia of Kentucky. New York City, New York: Somerset Publishers. 1987. ISBN 0-403-09981-1. United States Congress. "James Guthrie (id: G000534)". Biographical Directory of the United States Congress. Heidler, David Stephen; Jeanne T. Heidler; David J. Coles (2002). Encyclopedia of the American Civil War. W.W. Norton & Company. ISBN 0-393-04758-X. Retrieved 2008-11-24. "James Guthrie (1853 - 1857)". U.S. Department of the Treasury. Archived from the original on 2008-05-22. Retrieved 2008-11-21. Johnson, E. Polk (1912). A History of Kentucky and Kentuckians: The Leaders and Representative Men in Commerce, Industry and Modern Activities. Lewis Publishing Company. Retrieved 2008-11-10. Kerr, Charles; William Elsey Connelley; Ellis Merton Coulter (1922). History of Kentucky. The American Historical Society. pp. 20–21. Retrieved 2008-11-23. Kleber, John E. (2001). The Encyclopedia of Louisville. The University Press of Kentucky. ISBN 0-8131-2100-0. Wells, Donald R. (1996). Bernard S. Katz, C. Daniel Vencill, ed. Biographical Dictionary of the United States Secretaries of the Treasury. Greenwood Publishing Group. pp. 182–185. ISBN 0-313-28012-6. Retrieved 2008-11-23. Allen, William B. (1872). A History of Kentucky: Embracing Gleanings, Reminiscences, Antiquities, Natural Curiosities, Statistics, and Biographical Sketches of Pioneers, Soldiers, Jurists, Lawyers, Statesmen, Divines, Mechanics, Farmers, Merchants, and Other Leading Men, of All Occupations and Pursuits. Bradley & Gilbert. pp. 276–277. Retrieved 2008-11-10. Klement, Frank L. (1998). The Limits of Dissent : Clement L. Vallandigham & the Civil War. New York Fordham University Press. pp. 31, 283–286. ISBN 978-0-8232-1891-2. Silver, David M. (1998). Lincoln's Supreme Court. University of Illinois Press. pp. 172–173. ISBN 0-252-06719-3. Retrieved 2008-11-24. Spiegel, Anna Ruth (1940). "Public career of James Guthrie (1792–1869)". University of Louisville. Archived from the original (PDF) on 2011-07-16. Retrieved 2009-05-07. "James Guthrie". Find a Grave. Retrieved 2009-05-01. Guthrie, James. "[Letter] 1855 Jan. 9, Treasury Department [to] James W[harey] Terrell, Qualla Town [i.e., Quallatown], No[rth] Ca[rolina] / James Guthrie". Southeastern Native American Documents, 1730-1842. Digital Library of Georgia. Retrieved 21 February 2018.